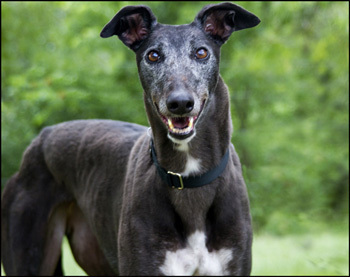 Jean, aka Sobe Oneeyedjack, is a 5-year-old black female born December 15, 2006. Her sire is Lonesome Cry and her dam is Sobe Little Gem. Jean has 49 races to her credit at VictoryLand on Greyhound-data.com, starting on July 30, 2009 and ending on May 14, 2011. 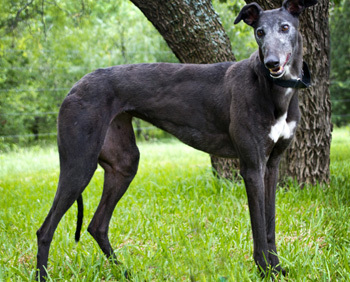 Jean is one of five dogs that came to GALT with the closing of the VictoryLand track. Check out this gorgeous gal! Jean LOVES stuffed squeaky toys, and especially likes to collect them in a pile on her bed. She has a calm, even temperament and gets along wonderfully with our other dogs. Her confidence is growing in leaps and bounds, as she's learning about so many new things like TVs, ceiling fans, stairs, and the doggie door. Jean is a loving girl who thrives on affection. She likes to be near her people without being too clingy. She loves to do the squirrel-500 in the back yard! Jean is a happy walker - no pulling. She's great around children too. Won't you come meet this long, lean beauty?